The place is located in the heart of the city and is the only Jewish Synagogue of the state. It is this place where the Jewish community of Gujarat gathers during their major celebrations. The place is very popular tourists too, thanks to its glorious architecture which is greatly reflective of their culture too. The place was established in 1934 by Bene Israel Jewish community who put forth its foundation through their cumulative effort. You can learn a lot about Jewish religion and preachings here. A great place to come and spend some time in. The people are friendly and more than often will fill you in on all the details that you might wish to know about the place. 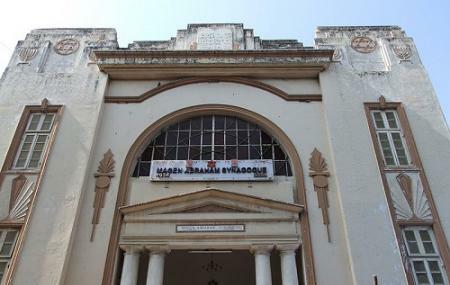 How popular is Magen Abraham Synagogue? People normally also visit Jaldhara Water World while planning their trip to Magen Abraham Synagogue. It’s the only synagogue in the whole state of Gujarat. Very unique and in the middle of a Muslim city. Sadly it was closed but I have been told that one can call in advance and ask for the gate keeper and arrange a tour inside. Its one and only synagogue of gujarat, india. It was built in around 1934. The jew community of ahmedabad conducts prayer here on every weekend. The main gate is mostly closed. The entry is from another side gate.